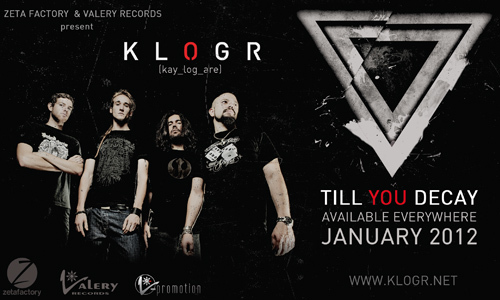 1/2/2012 – Milan, Italy – One of the heaviest new Alternative-Metal groups to emerge from Italy, Klogr (pronounced Kay-log-are), will be releasing their mind-blistering debut CD titled ‘Till You Decay’ in January 2012 on Valery Records. Described as “an alternative rock/metal album in which both the instrumental and the vocal lines are delivered very heavily at times and more melodic at other times creating the sound of Klogr”, fans of the band and music press worldwide have been anticipating the CD release. The album is based on the concept that the society around us controls us, judges us, conditions us and ultimately suffocates us. A psychological game of massacre, control and power over the masses, in which they use fear and anxieties to destabilize a person into something more fragile, more controllable and more subservient… till you decay. The Klogr’s name is a reference to the law of Weber-Fechner, developed in the second half of the the 800, which is known as the fundamental psychophysical relationship (S=K log R). The project, which resides on the thin line between alternative rock and alternative metal, is led by Gabriele “Rusty” Rustichelli (producer at ZetaFactory, former guitarist of SensAzionE and other Italian alternative projects). Klogr develops a a powerful sound that draws energy from a philosophy that challenges the contemporary culture, where every sense is cleverly used against men in the name of profit. Along with Rusty (vocals and guitars), and the other members of the Italian/American line-up include: Nicola Briganti (guitars and a member of Lena’s Baedream), Todd Allen (bass and a member of Beside Myself) and Filippo De Pietri (drums). All together they complete the Klogr circle. The idea took shape in May 2010 and in June 2011 the group began recording their debut album at the ZetaFactory studio. From that point on, Klogr captured the attention of the public and aroused much curiosity among professionals and fans by posting several viral videos, showing the progress of the band in the studio. The date 11-11-11 brought the world premier of the group’s live show. The powerful attack of the eleven songs that make up the track list for ‘Till You Decay’ was greatly enjoyed and well-received by the enthusiastic audiences. After the ten video presentations of the band’s sound, the first complete track to run on its network was “Live Dying”, the album’s opening track. “Bleeding”, the first chosen single due out in January, will be accompanied by a video that combines graphics and cinematography in line with the mood of Klogr. ‘Till You Decay’ is scheduled to be released worldwide on January 10, 2012 and will be supported by a US west coast tour and several European dates.